Author of this plugin Martin Lueders was inspired by one of Roland's last analog polysynths JX-8P and the Roland PG-800 programmer that went hand in hand with it for easier use. The actual interface is based on the PG-800 cause the interface on the synth itself was a bit poor and hard to program. The synth itself offers up to 12 voice polyphony (twice as the original), two DCO's with Saw, Square, Pulse and Noise signals, two envelopes, 24 dB resonant LP filter and 3 stage HP filter and a stereo chorus. Huge feature of this plugin is that you can import and export of JX-8P Sysex data. 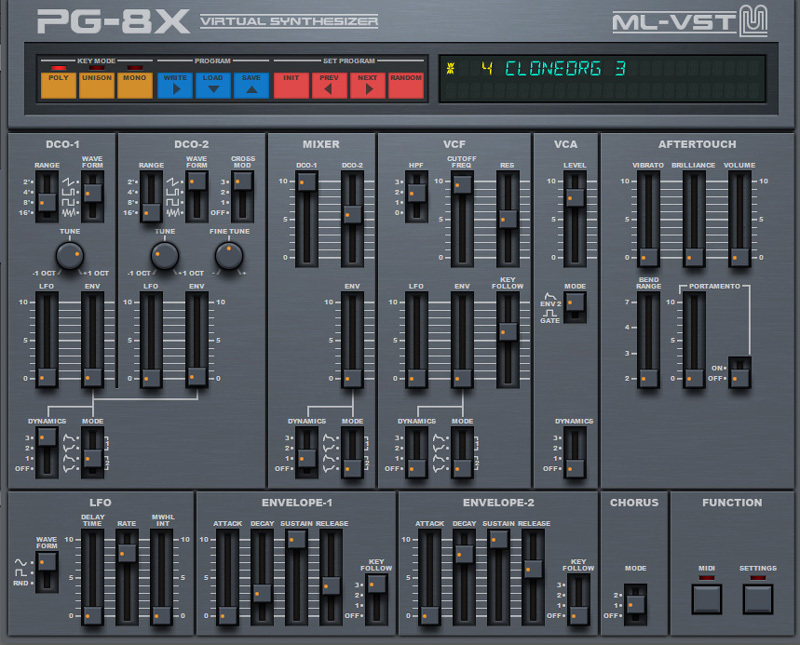 That means that you can load the patches from the original machine and since Roland JX-8P has been around from 1985. I imagine that there are some good patches around to play with. You can download this plugin for free here: https://sites.google.com/site/mlvst0/pg8x-2. If you end up using this one, it would be nice to support the author by donating. There is also a Facebook page and a forum thread.